John Birks Gillespie was born on 21 October 1917 into a family of musicians in Cheraw, South Carolina. At the early age of four he was already playing the piano, and for a while could not decide between the trombone and the trumpet. When he was a teenager, he opted for the trumpet out of admiration for Roy Eldridge. He began his professional career in 1935, when he played his first veritable gig in Philadelphia with Frank Fairfax’s orchestra. He soon moved from Teddy Hill’s big band (with whom he recorded his first tracks) to Cab Calloway’s group, only to be quickly dismissed when Calloway tired of both his fooling around and his instrumental acrobatics. The musician who so aptly took the name of Dizzy took every opportunity to meet and collaborate with musicians across the spectrum, from classical to modern, making the acquaintance of Ella Fitzgerald, Benny Carter and Fletcher Henderson, as well as Thelonius Monk. In 1942, he joined the Earl Hines Orchestra, and there he met the young singer Sarah Vaughan, an alto saxophonist with an innovative style named Charlie Parker, and a certain Billy Eckstine. Together, Eckstine and Gillespie helped found a big band, and from 1944 onwards, most of the young modernist musicians, including Wardell Gray, Oscar Pettifor, Art Blakey, Fats Navarro, Sonny Stitt and Miles Davis, played with them. All the while, he worked the clubs on 52nd Street (the Onyx Club, Minton’s Playhouse), jamming along with other revolutionary musicians like Charlie Parker, Bud Powell, Ray Brown, Max Roach and Milk Jackson at the legendary sessions that soon gave rise to bebop. A virtuoso instrumentalist with an eccentric, high-speed style, and an innovative composer (“Night in Tunisia”, “Groovin’ High”, “Salt Peanuts”, “Woody’n You”), Gillespie made the first historic recording of this new genre in 1945 and became famous overnight. In 1946, he founded his own big band. With the help of talented arrangers (Tadd Dameron, George Russell, John Lewis, Chico O’Farrill) Gillespie scaled up the aesthetics of bebop for big bands. Until the early 1950s, when the group disbanded, Gillespie had greats like Monk, Ray Brown, Kenny Clarke, James Moody, Cecil Payne, Budd Johnson, John Coltrane and Paul Gonsalves play in his large orchestra, but most importantly, importantly, when he brought Chano Ponzo from Cuba into the rhythmic section to play the congas, he laid the foundations of Afro-Cuban jazz. In 1952, he began using his famous angled trumpet with the upward-facing bell that became his hallmark, and for the rest of the decade he mainly played in small bands, although he continued to participate regularly in the JATP (Jazz at the Philharmonic) series that Norman Granz organized. In 1956, commissioned by the State Department to spread jazz through the Middle East, Greece and South America, Gillespie put together a large band with a flamboyant cast that included Benny Golson, Wynton Kelly, Phil Woods and Melba Linston, with Quincy Jones as music director. From then on, he alternated decidedly bop gigs with more hybrid performances peppered with Afro-Cuban rhythms, in both small and large bands. Throughout the 1960s, Gillespie collaborated sporadically with some of the finest jazz musicians such as Sonny Rollins, Duke Ellington, Count Basie, Oscar Peterson, Stan Getz, Roy Eldridge and Sonny Stitt, and the foremost specialists of Latin jazz, including Lalo Schifrin, Ray Barretto, Mongo Santamaria, Machito and Candido. 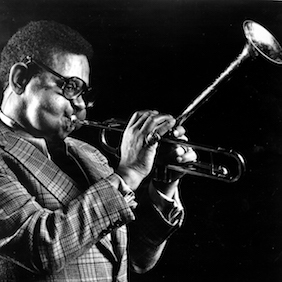 During the 1970s, although he would play with prestigious groups like the Giants of Jazz, bringing together some of bebop’s ageing stars, and the Trumpet Kings, with Clark Terry and Roy Eldridge, Gillespie continued to play stages world-wide, leading small bands that successfully brought together old jazz hands and promising young musicians (Alexander Gafa, Mike Longo) to make music that retained its youthful strength. He published his autobiography, To Be, or not … to Bop, in 1979; after that, the early 1980s proved more erratic for him. He nonetheless continued to spread the good word of jazz around the planet, mainly with his United Nations Orchestra, which he founded in 1988 with musicians including Paquito D’Rivera, Arturo Sandoval, Flora Purim, David Sánchez and Danilo Pérez. He never gave up, and until his death on 6 January 1993 in Englewood, New Jersey, continued to ensure that his music, which intrinsically features elements inspired by many cultures, was a place where people could come together in reconciliation and harmony.